AC Milan have released a full club statement insisting the controversial post-match celebrations from Tiemoue Bakayoko and Franck Kessie were not “aggressive or anti-sporting”. 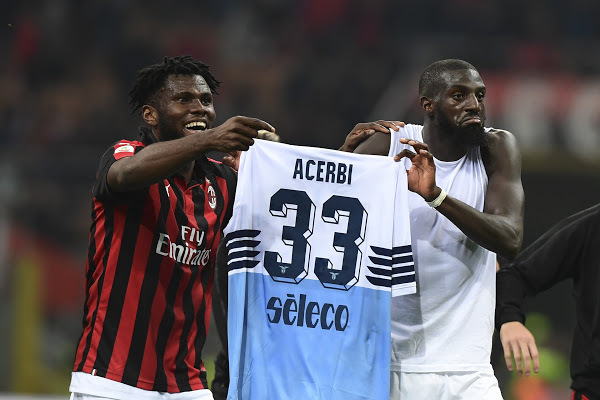 The Rossoneri clinched a vital 1-0 win over Lazio on Saturday, but most of the focus was centred around Bakayoko and Kessie after the duo held Lazio defender Francesco Acerbi’s shirt aloft while celebrating in front of the San Siro crowd. Acerbi – a former AC Milan defender – was trying to defuse tensions after the final whistle by exchanging shirts, having been involved in a war-of-words with the Chelsea loanee prior to the match. The 31-year-old stated that there was “no comparison” between his teammates and the Milan players and suggested the capital club are “stronger” than his former employers. OK Acerbi see you Saturday. And after the match, following Kessie’s penalty winner, the pair went on to lift his shirt in what appeared to be a taunting manner. Fomenting hatred is not sport but a sign of weakness. However, both players have since apologised, with Bakayoko saying it was a “playful gesture” and not meant to “disrespect anyone”, while Kessie stated it was just meant to be a “joke”. AC Milan have since issued a statement, echoing the views of both players, insisting that the celebration was not meant to be disrespectful towards Acerbi or Lazio. It was a celebration of an important victory with no mockery, no aggressive or anti-sporting intentions: an innocent, naive response to the friendly exchange of tweets with Acerbi in the days before the race. Milan is founded on values ​​such as respect (on and off the field), equity, inclusion. Tiemoue and Franck know, share and express those values ​​every day. No more controversy we will meet again on the field.